It’s not every day that the Olympic Torch is run past the end of your road is it…. 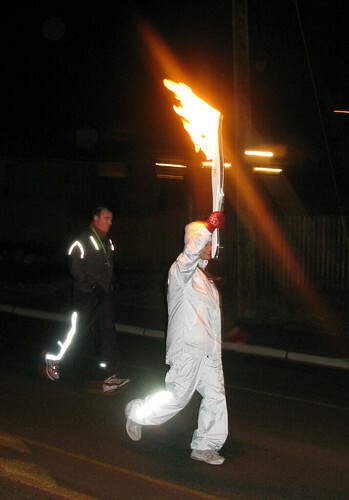 Yep, on it’s trek across Canada in time for the Winter Olympics in Vancouver 2010, the torch came right past the end of our street. Now, let’s hope the snow holds out until then. It’s looking "precarious" last time I watched the news, so much so, that they might have to ship the stuff in from other parts of the country. Yeah, I know. "You’ve got snowproblems in Canada? I thought you all lived in igloos!" Happy New Year to all and any who may find themselves discovering my ramblings…. Right, this year, no resolutions, just a determined effort to get a move on and make the year more productive than the last one, not to mention, the last 4 and a half….